From left, Janette Duran, Lauren Maucere, and Stephanie Johnson, all specialists at Marlton School for the deaf within LAUSD, cheer with thousands of other teachers and supporters as speakers talk to the crowd during a rally at the California Charter Schools Association in downtown Los Angeles on Tuesday, Jan. 15, 2019, the second day of the Los Angeles school teachers strike. Zeccola said he’s seen his fellow teachers — even himself — calmly accept that status quo over the last decade as tighter and tighter budgets started strangling classroom education in America’s second-largest city, even as the rest of L.A.'s vibrant economy was booming. That meant passive acceptance of skyrocketing class sizes that often jammed more than 40 kids into a room, or forcing schools to make painful spending decisions whether to make nurses, librarians, or mental health aides only part-time — or to ditch those vital services completely. At the Sherman Oaks Center for Enriched Studies where Zeccola now teaches English and drama after working for years in economically distressed South Central L.A., the school found the cash to pay a librarian two days a week — two days more than many other nearby public schools. When the calendar flipped over to 2019, Zeccola decided that enough was finally enough — and so did 33,000 other unionized school teachers in the City of Angels. Monday’s walk-out by the United Teachers Los Angeles — the city’s first teachers' strike in 30 years — is wrapping up its first week with no end in sight, and with a fervor that feels less like a bargaining dispute and more like a rain-soaked revolution. For local readers who recall the bitter picket lines that frequently closed public schools in Philadelphia — and in other large U.S. cities — during the 1970s and ’80s, this is not your mother’s teacher’s strike. Yes, wages are on the table, but with labor and management only half a percentage point apart, teacher salaries or benefits aren’t really the heart and soul of this showdown. It might sound cliched, but L.A.'s teachers truly seem to striking less for themselves and more for the kids — much like the “red wave” of educator walkouts that during 2018 shocked “red states” like West Virginia, Oklahoma and Arizona where Republican lawmakers had been starving public schools for years. In Southern California, teachers aren’t only armed with specific grievances such as growing class sizes and shrinking school services, but are also more broadly worried about the rising clout and enrollment numbers of charter schools and the privatization of public education — concern that spiked when the Los Angeles school board hired an investment banker with no education background, Austin Beutner, as superintendent last May. “It seems like this is the privatizers' last stand,” said Zeccola. Observers say Beutner was hired to navigate an expected even-greater cash crunch that’s looming for L.A. schools — which, like classrooms all across California, are constrained from raising revenue by a law that voters approved in the taxpayer revolt of the 1970s — while teachers are looking to liberal Democratic lawmakers and a new governor, Gavin Newsom, as a kind of deus ex machina to come down from the heavens and solve the long-term money crisis. Indeed, that’s part of what makes the L.A. education standoff such a compelling story. It flips the switch on 2018′s plot-line of GOP hostility toward public schools in largely rural states. Every institution that’s sponsored the policies creating this crisis — the city of Los Angeles and the district school board, as well as California’s legislature and its governor’s mansion — have been in the unimpeded sway of Democrats for years. The problem — at least for the teachers' union and other critics — is that for all of the Golden State’s much-ballyhooed progressivism, the reality is that neo-liberal hedge-fund Democrats have been largely handed control of public schools. That seems especially true in big-city districts where hedge-fund billionaires and other decision-makers wouldn’t dare send their kids to the public schools that working-class and poorer parents of color have little choice but to enroll their children. The state of California is, independently, the world’s fifth-largest economy (bigger, now, than the UK) yet in education spending it’s in the bottom 20th percentile of American states. The vacuum in both money and political leadership has been filled by powerful oligarchs like the Los Angeles billionaire Eli Broad, a close ally of new superintendent Beutner who in 2015 proposed converting half of the city’s schools into charter schools. This is why a war on Wall Street-fried public education is getting close attention in other big cities that have also taken the hedge-fund-flavored pro-charter anti-union pseudo-liberal approach to education, such as Chicago, New York ... and Philadelphia. Especially Philadelphia. After all, School Superintendent William Hite was educated at the Broad — as in Eli Broad, its founder — Superintendent Training Academy in the early 2000s before coming here, and the erosion of public education at the hands of charter schools has been arguably worse here than out in L.A.
“I said to my members, ‘What’s happening to Los Angeles teachers is what will happen here; don’t think that it won’t,'” the Philadelphia Federation of Teachers union chief Jerry Jordan told my Inquirer colleague Kristen A. Graham a few days ago, noting that negotiations leading up to a August 2020 contract expiration will start soon and that a prohibition on strikes that existed when the Philadelphia district was under state control is no longer in effect. That’s just one sign that the aftershocks from a political earthquake in California may be felt from coast-to-coast, and for years to come. And that’s not all, in many ways. 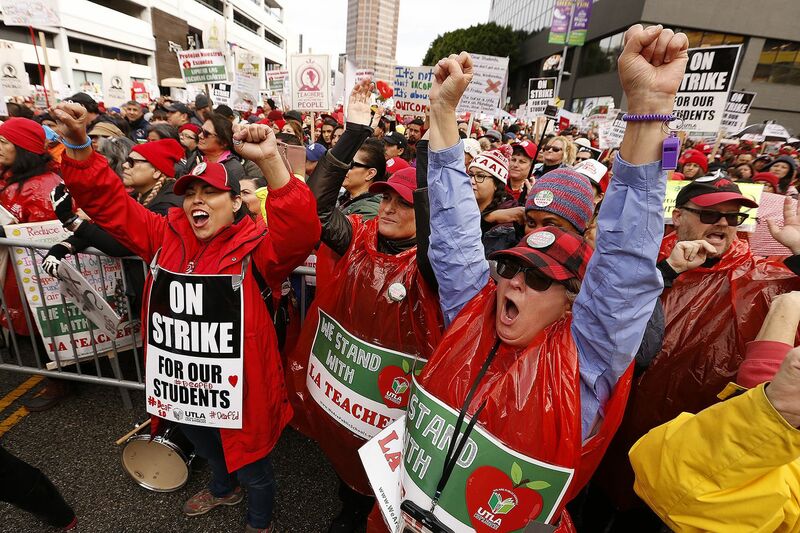 the L.A. teacher strike feels more like the cutting edge of a wider social revolution. For one thing, as noted in a recent Atlantic analysis of the standoff, both the students and the teachers who remain in the city’s public schools after the charter-school stampede are heavily Hispanic, and many see the roots of this movement not so much in the contract battles of yesterday but the so-called “brown power” uprisings of the 1960s and early 1970s — a fight for social justice. Also, timing is everything. And the thousands of red-shirted teachers and students flooding the uncharacteristically rain-soaked streets of Los Angeles this past week are showing what protest can do at the exact same moment when things are unraveling everywhere else, when 800,000 federal workers have been working without pay for a month, when many more who depend on Washington for income or vital services are also about to be slammed by the government shutdown, and when our deer-in-the-headlights Establishment seems flummoxed by a growing case for impeachment of a dangerous president.